there is a Fish Window Cleaning location ready to serve you! We know you're busy and it's hard to keep your home looking beautiful. That's why we provide a wide range of services for your home to keep it looking its best. From interior and exterior window cleaning to gutter cleaning to chandelier cleaning, we can make your home sparkle! Our team is respectful of your home, working around your possessions carefully. We wear clean shoe covers and use cloth pads under your windows when cleaning indoors to protect your carpet and wood floors. We even use environmentally-friendly cleaning products so you and your family don't have to deal with harsh fumes. Learn more about our residential services. 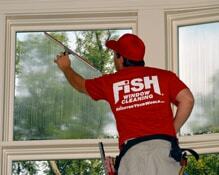 Fish Window Cleaning has been in business since 1978 so we know what is important to business owners. The most important thing is making a lasting impression on our customers. Let us help give your customers a great impression with our maintenance programs. We can remove cobwebs, fingerprints, smudges, and even holiday paint from your windows. We customize our programs to meet your schedule, budget, and needs. Our cleaners are licensed, bonded, and insured for added protection and peace of mind and, as always, we are committed to your satisfaction. We provide hassle-free service. No contracts are required. We want your experience with us to be as simple as possible! We are committed to your satisfaction. If you're not satisfied, we're not satisfied. We stand behind our work so if something isn't right, we'll make it right! Our team of window cleaners consists of trained and uniformed professionals. We lead the industry with our premier safety program to ensure the protection of our customers and cleaners. We offer customized cleaning schedules ranging from weekly to annually. We tailor all of our cleaning programs to fit your needs. We show up when we say we're going to be there. If your zip code is not listed above, please call (877) 707-3474.